On this page you will find links to various Commodore 64 related sites, including game information/archive sites and C64 hardware sites. Please note, the sites linked here are not 'affiliated' with Compilation64 and we are not responsible for their content. 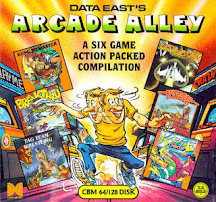 A site maintained by a team of enthusiasts from all over the world who wish to archive C64 games, as well as catalogue information on their creators. So far GB64 has successfully compiled a list of over 15000 entries, complete with screenshots. A tribute site to popular C64 magazine ZZAP!64, complete with a full set of scans of all issues completely free to view and download, including overviews of all editorials, game reviews, programmers diaries and a popular ZZAP! RRAP message board/forum. Huge game archive/download site managed by Dohi. Contains thousands of games, including multiple versions with different cracks. Provides screenshots, descriptions, reviews, videos and downloads of completed C64 games to save you playing! Also lists games with no ending. News about and reviews of brand new games that are released for retro systems, including the C64. Recommended! The High Voltage SID Collection (HVSC) is a freeware hobby project which organises and archives Commodore 64 music (also known as SID music). Searches for the lost C64 games that never were (or were, but never saw the light of day! ), featuring scans, screenshots, downloads, interviews and more. Is your C64 playing up or just plain dead? There may be some helpful information on Ray Carlsen’s site. Collects sports games made for the C64. Also collects information about the games, such as manuals, covers, adverts and SID's. Large FTP based C64 game archive. Source of manuals for Commodore hardware and games. Archive of scene related releases, including demos, cracks, games, etc. Contains details for thousands of classic C64 games. Users are allowed to comment and rate the games.